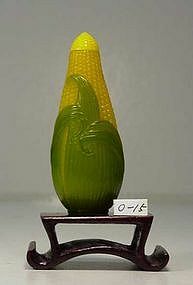 This green and yellow bitter melon shape overlay glass snuff bottle is 2 ½ inches tall and 1 ¾ inches wide. 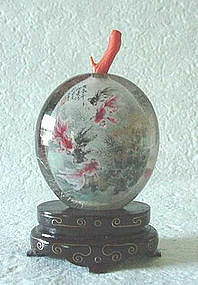 It depicts a grasshopper landing on a Chinese bitter melon plant; a moth (or butterfly) is flying around a flower. 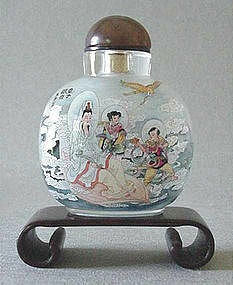 The workmanship is great and the idea to make the bottle like a melon definitely makes it interesting. This small carved two tone agate snuff bottle is 2 5/8” high, 1 ¼” wide and 5/8” thick. The artist used two darker spots to carve as two fish. This makes the double gourd shape snuff bottle unique. It is very well hallowed, polished and in great condition. 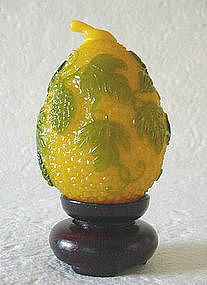 This unusual and inventive designed leaf shape snuff bottle is 3 inches tall 2 ½ inches wide and less than 1 inch thick. The color is from beige to burgundy and very well polished and hollowed. It depicts three squirrels chasing each other under grapevine. The workmanship is excellent. The artist Chen Ke uses the natural color of the stone so well, it looks like inlay or overlay work. Please e-mail us for more information about him and his work. This carved agate contemporary snuff bottle is 2 ¾” high, 1 ¾” wide and 1 ¼” thick. 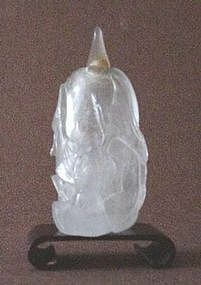 The lighter part was carved as “Buddha hand citron” shape and used as the body of the bottle. 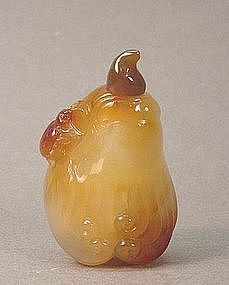 The darker color agate was carved into a small bug which is resting on the fruit. It is well hollowed, polished and in great condition. 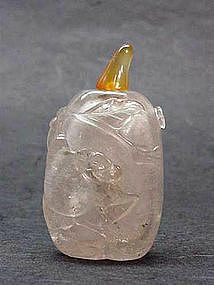 This carved rock crystal snuff bottle is 2 ¾ inches tall, 1 ½ inches wide and 1 ¼ inches thick. It depicts a bird in a lotus pond. The snuff bottle is well hollowed and polished. It has cone shape agate top. The crystal has natural grains and impurities. This very well carved agate contemporary snuff bottle is almost 3 ½” high, 1 ¾” on the widest part and 1 1/8” thick. It is carved as “Hu” shape with two loose rings on each side. 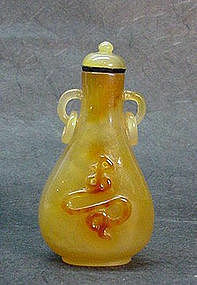 The darker color of the agate was carved into the character “SHOU” (Long Life) and makes the snuff bottle interesting. It is well hollowed, polished and in great condition. 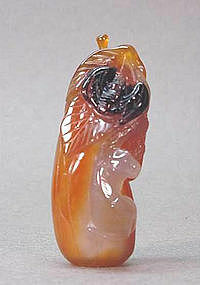 This very well carved agate contemporary snuff bottle is 2 ¾” high, 1” wide and 3 quarters of an inch thick. The artist used the colors very well. The lighter part was carved as the body of the bottle. 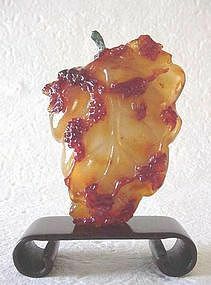 The dark part was carved as a bamboo branch with leaves and small Ling Zhi (tree mushroom). It is well hollowed, polished and in great condition. 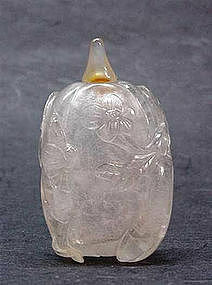 This hand carved rock crystal snuff bottle is 2 ½ inches tall, 1 ¼ inches wide and 1 inch thick. It depicts a bird resting on a small branch of a gourd plant. The snuff bottle is well hollowed and polished. It has a cone shaped agate top. The crystal has natural grains and impurities. 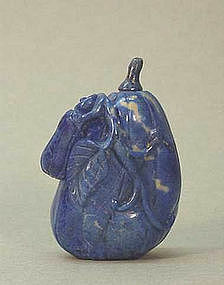 This carved lapis lazuli melon shape snuff bottle is 2 ½ inches tall, 1 ¾ inches wide and 1 ¼ inches thick. 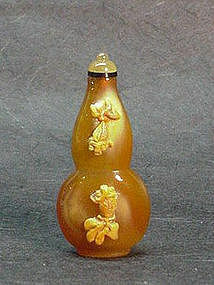 The artist carved a large melon as the snuff bottle and a smaller melon with leaf and spouts as decoration. The snuff bottle is well hollowed but has some natural flaws. It is in great condition. 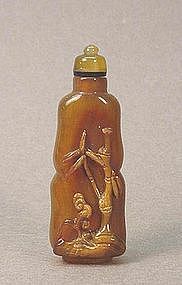 This very well carved contemporary snuff bottle is 2 ½” high, 1 5/8” wide and 1” thick. 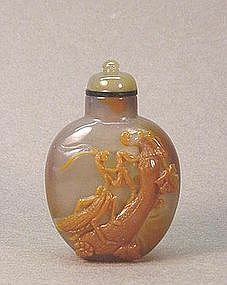 The lighter part was carved as the body of the bottle and darker part was carved into a praying mantis resting on a cucumber. The workmanship is precise and clear. It is well hollowed, polished and in great condition. 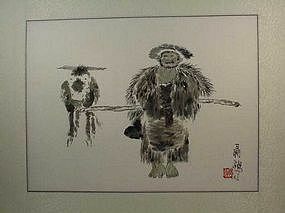 Chinese brush painting by Nie Ou. A well known female artist in China, she was born in 1948. She graduated from the Central Art Academy School in Beijing and has received several awards. Her work is shown worldwide. This is one of seven pictures we have. It is mounted on silk brocade. The entire area is 19 inches by 29 inches; the picture size is 13 inches by 18 inches. 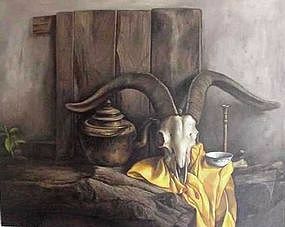 MEDIA: Chinese oil painting TITLE: Skull SIZE: 32 inches x 39 inches ARTIST: Zhang Shuang-Zhu was born in 1964 in Beijing. Now a professional artist, he graduated from the Central Academy of Fine Arts and Crafts in 1994. 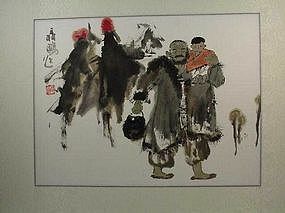 He participates in the annual Chinese Oil Painting Essence Exhibition and has held exhibitions in Hong Kong and Taiwan. His paintings have been acquired by collectors from Europe, America, Macau, Singapore, Hong Kong and Taiwan.